Prehistoric life is the archive of evolution preserved in the fossil record. This book focuses on the meaning and significance of that archive and is designed for introductory college science students, including non-science majors, enrolled in survey courses emphasizing paleontology, geology and biology. 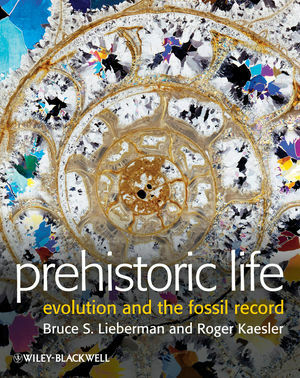 From the origins of animals to the evolution of rap music, from ancient mass extinctions to the current biodiversity crisis, and from the Snowball Earth to present day climate change this book covers it, with an eye towards showing how past life on Earth puts the modern world into its proper context. The history of life and the patterns and processes of evolution are especially emphasized, as are the interconnections between our planet, its climate system, and its varied life forms. The book does not just describe the history of life, but uses actual examples from life’s history to illustrate important concepts and theories. Bruce S. Lieberman is a Professor in the Department of Geology and a Senior Curator of Invertebrate Paleontology in the Natural History Museum/Biodiversity Research Center (NHM/BRC) at the University of Kansas (KU), U.S.A. His research focuses on the study of evolution in the fossil record, including the origin of animals, macroevolutionary theory, and biogeography. Roger L. Kaesler passed away in 2007. He was Director of the Paleontological Institute as well as a Professor in the Department of Geology and a Senior Curator of Invertebrate Paleontology in the NHM/BRC at KU. His research focused on paleoecology and fossil arthropods. History, Science, and Historical Science. Conclusions: Fossils as Curious Stones. 2. The Nature of the Fossil Record. 3. Organizing the Fossil Record. History of Ideas on Biological Classification. What is a Species and How Does a Paleontologist Identify Them?. Conclusions: the Difference Between Inanimate Atoms and Living Things. A Biological Definition of Evolution. The History of Evolutionary Thought. Darwin and Wallace: Never Ask a Stranger to Present Your Paper at a Meeting You Cannot Attend. Conclusions: Why was Natural Selection Not Endorsed at Once by Many Scientists?. 5. Macroevolution, Progress, and the History of Life. Does Evolution Happen Gradually or Episodically?. Natural Selection Operating Above and Below the Level of the Individual Organism. Progress and the History of Life. Conclusions: Patterns and Processes of Increasing Complexity. 6. Extinctions: The Legacy of the Fossil Record. Boundaries in the Geological Time Scale and the Nature of Extinction. How has the Existence of Mass Extinctions Influenced the History of Life?. Were Most Extinctions Caused by Asteroid Impact?. The Permo-Triassic Mass Extinction—Causes and Consequences. Other Mass Extinction Events: The Late Devonian and the End of the Triassic. Habitat Degradation and Mass Extinctions. The Sixth Great Mass Extinction: The Current Biodiversity Crisis. Conclusions: Lessons from the Past and Future Prospects for Humanity. 7. Systematics and the Fossil Record. Methods and Approaches in Systematics. The Growth of Molecular Biology and Improvements in DNA Sequencing Technology. The Spread of Computers and Computer Programs Used to Study Evolutionary Relationships. Systematics and How to go About Identifying Species in the Fossil Record. Systematics and its Relevance for Identifying Patterns of Mass Extinction. Systematics and the Meaning of Adaptations. 8. Principles of Growth and Form: Life, the Universe, and Gothic Cathedrals. Galileo’s Principle and its Relevance to the Biology of Living Organisms. Galileo’s Principle and Constraints on the Evolution of Large Body Size. Galileo’s Principle and its Relevance to Medieval Architecture. Galileo’s Principle and its Relevance to Cratering Density in our Solar System. 9. The Role of Fossils in the Genesis of Myths and Legends. Paleontologist’s Have Come from Many Different Walks of Life and Have Sported Many Different Hairdos. Native American Contributions to Paleontology. 10. Plate Tectonics and its Effects on Evolution. Early Ideas on Continents in Motion: Continental Drift. Plate Tectonics: Continental Drift in a Different Guise and with a Valid Mechanism. The Evolutionary Implications of Plate Tectonics. 11. Life, Climate, and Geology. Some of the Major Factors that Govern the Climate System. Examples of How Life has Influenced Climate: The Difference Between the Proterozoic and the Permian. Life Influencing Geology: the Form and Shape of Rivers and the Rocks they Leave Behind. Plants, Oxygen, and Coal: More Examples of Life Affecting the Atmosphere and Geology. How Geology Affects Climate: Considering How Plate Tectonic Changes have Contributed to Climate Changes Over the Last 60 Million Years. 12. Patterns and Processes of Precambrian Evolution. The Earliest Evidence for Life in the Geological Record. The Time of Pond Scum and the Rise of Oxygen. For Billions of Years Organisms Have Been Modifying the Atmosphere and Their Environment. More Effects of Rising Oxygen Levels. The Evolution of the Eukaryotic Cell. 13. The Cambrian Radiation and Beyond: Understanding Biology’s Big Bang. Life Before the Cambrian Radiation. The Burgess Shale and the Cambrian Radiation. The Ordovician Radiation and Concluding. 14. The Evolution and Extinction of Reefs Through Time: From the Precambrian to the Current Biodiversity Crisis. How Modern Cnidarian Corals Feed. Corals and the Biodiversity Crisis. Lessons from Human Effects on Modern Reefs. 15. Key Evolutionary Transitions: The Origins of Multicellularity and the Evolution of the Vertebrate Brain. The Evolution of the Vertebrate Brain. Trends in Brain Size Within Primates and. 16. Key Events in Vertebrate Evolution. The Origins and Evolution of the Tetrapods. 17. Are We Alone in the Universe?. What is the Potential that Humans will Encounter Extraterrestrial Civilizations?. Radio Waves and the Search for Extra-Terrestrial Intelligence. Possible Evidence for Life in a Martian Meteorite?. 18. Humanity: Origins and Prospects. How do New Species Evolve—The Shift from Chimps to Hominids. Humans in a Changing Climate. Mapping a Course for Future Changes—Climate and Life. Companion Site Click here to find figures and tables for downloading.